According to this presentation construction is at 55% completion. Also, University is closed between Rice and Robert now, and work at the U of M will ramp up over the summer. Double crossovers have been laid next to TPT (1 block west of SPUD), and the pair of single crossovers appeared to be in place between Cedar and Robert along 12th Street. Neither area has had them embedded in concrete yet, though. Another photo I got of the Union Depot area today, including the new Nice Ride station installed sometime in the last few days (the Nice Ride stops don't have their normal map/advertisement holder installed yet). The LRT station also has the yellow bumpy tiles installed at the platform edge, and has the final layer of tan-colored concrete laid down. Signage is installed (all the way down to "No Smoking" stickers). Does anyone know when Washington Ave is going to open back up to busses? In the middle of July East River Parkway closes completely, and that's where the eastbound busses go currently, so the only way to close that is if busses are allowed back on Washington. There doesn't seem to be much effort being made between the bridge and Union St at getting a paved road up, but sometimes these things happen quickly at the last second when they're needed. As far as I know, Washington won't be ready for buses until next year (2013). Google's aerial imagery got updated (supposedly from early April this year), and that showed that a stretch of pavement just west of Church Street hadn't even been ripped up yet, so I'm fairly doubtful about having even temporary bus lanes there. I don't know what the detour plans are. It might be possible to temporarily make Pleasant Street a two-way by removing parking, or everything might just get redirected across the 10th Avenue Bridge, or maybe they'll just loop everything south along East River Parkway, around the hospital and back up Harvard/Pillsbury. I work on campus so I can tell you that everything there has been ripped out. Harvard to Oak St is paved, and then plan on having the sidewalks open in the next few weeks as well. I know in two weeks that traffic on the bridge will move to their final positions. I go by the West Bank station every morning and night on the bus to and from work, and a couple times a week I walk down Washington Ave, so I've got quite the front line view of everything in that area. For that matter if anyone's curious about progress on campus, I can probably answer your questions. Curbs have been constructed to Western Avenue. East bound western avenue station is being poued. Robert Street station, aside from electrical, is largely finished. Please get out to University for excellent food. The restaurants need your business. Both have tons of pictures of construction. The thread on skyscrapercity even has some from May that were lost on me while Minnescraper died. Thanks to everyone who's gone out and not only taken construction pics, but uploaded them! Especially for those of us who are to far away to check in on construction on a regular basis! 2: Early morning and late night service ends at Oak and Washington. 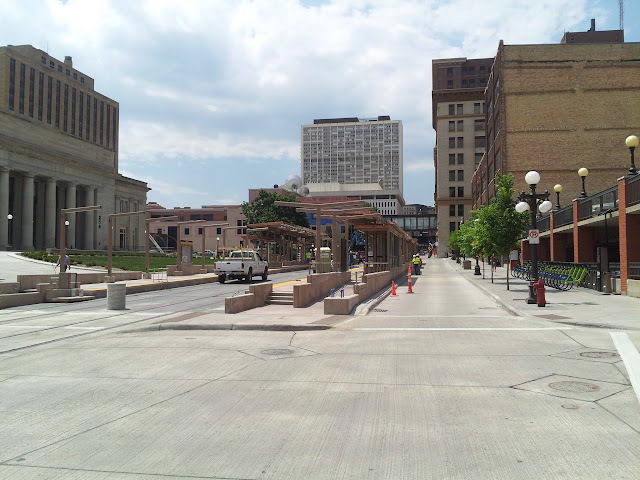 3: Moved to Cedar/Minnesota in Downtown St. Paul. 6: 6U extended to 27th Av SE and University to serve Stadium Village. 16: Day/evening service every 20 minutes from Downtown St Paul to Oak and Washington. Owl service every 60 minutes, extended to Downtown Minneapolis. DT StP routing extended to Kellogg and Wall, DT Mpls routing changed to inbound on 7th (for connections at 7th/Nicollet), outbound on 4th. 21: Weekday evening service on the Selby (A) branch improved to every 20 minutes. 62: Sundays improved to 30 minutes on Rice St. Interlined with the southern portion of Route 67. SB on Cedar, NB on Wabasha. 63: Extended to Raymond LRT, service improved to 20 minutes during day and evening hours. 65: Service to Downtown St. Paul eliminated, now begins at Grand and Dale. Improved to 20 minutes during day and evening hours. Early and late trips only run from Maryland to Selby. 67: Smith Ave service now part of Route 62. Extended from University and Fairview to Franklin and Hiawatha via University and Franklin with a deviation to Riverside Hospital, replacing Route 8. Service improved to every 20 minutes during day and evening hours. Early morning and late night service, as well as 2 of every 3 Sunday buses, will only run from Downtown St. Paul to University and Raymond. 83: New route from Como and Snelling to W 7th and Albion via Lexington. Runs every 30 minutes. 84: 2 branches on southern end, one via Ford Pkwy to 46th LRT, and one via Fairview and Montreal to W 7th St. Improved to every 10 minutes, except at night hours. 87: Service will be more direct, and will operate every 20 minutes, day and evening. Service hours extended to Midnight. 94: Peak only, every 10-15 minutes. Stops at the Capitol and Snelling eliminated. Park River Plaza stop remains. Via 5th/6th in Downtown St. Paul and 6th/7th in Downtown Minneapolis. 134: Rerouted to Cleveland and Marshall to match Route 87. Span of service will be reduced. 144: Eliminated. Use LRT and 84. 50U: Huron Station service will be eliminated. If the U doesn't provide a shuttle, EB I-94 routes will not stop at Huron. Roadways on the west bank are closer to completion... The last major works appear to be the median from the 19th ave bridge to the washington av bridge. The washington av bridge looks like it will be done soon. Inside barriers still need to be poured and tracks installed. The east bank is still taking its time, but road works up to harvard are nearing completion. Prospect park north side road work should be wrapping up soon. 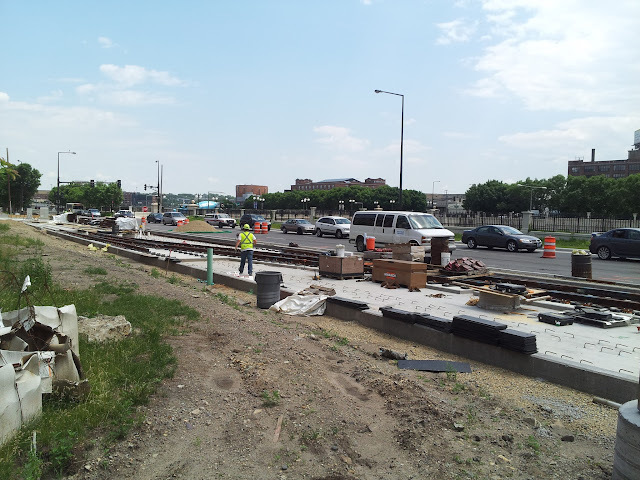 Tracks have been installed for the 29th ave curve. 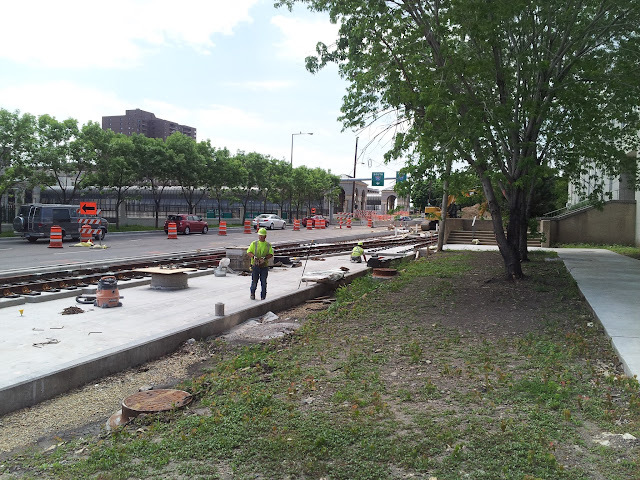 On the saint paul side of things, it looked like the south side was being prepped for curb installation from western to marion. Grotto to western looks like it could be finished in a week or two. construction on the north side is in full swing. Capitol, east bank and cedar st appear to be the farthest from completion at this time. It will definitely be cool to see tracks and stations the whole way this fall. I took a few photos, I will have to upload them later though. Cedar street in downtown is definitely slow going. I work along this street. What a mess. I've watched crews for the last year or so dig up the 7th and Cedar intersection (Wells Fargo Place, Town Square, MPR HQ) about 10 times already. It's maddening. They'll dig up one part, do some utility work, refill the hole, pave it and repeat in another section a few weeks later. Over and over. I'm sure there's a method to the madness. Keeping the water, electricity, gas, sewage, etc for this major artery online. But I CANNOT wait for this corner to be done once and for all. Some pictures from the http://lettherebelightrail.blogspot.com/ site. Looks like there is a plan to build a pedestrian tunnel from the Rice St Station to the Capitol. This is good news. I had heard of a tunnel, but I thought is was only to go under University and heard nothing of one to the station. Will we be lucky and get moving sidewalks in them too!! I'll be in St. Paul on Thursday so I'm looking forward to walking the line from the Capital to the Union Station and seeing how things have progressed since my April visit. It makes sense for the 2, since it goes down that ramp anyway, but it seems like a bad idea for the 3 and 16 to have to turn off washington, go up the NW cedar ramp, turn onto cedar, and then turn back onto the SE ramp just to make that connection. There has to be a better way. Anyone know if this routing is permanent? FISHMANPET wrote: Anyone know if this routing is permanent? Since this is essentially the same routing they had before construction, I would assume that yes, this is permanent (the 16 will not run this far west after trains are running, except between 1 and 5 am). I would like to see 3 buses run on Washington in Downtown to better serve the Mill District after CC is up, in which case it would make sense to take these exits, but they didn't put that change (suggested in the Access Mpls plan) into the CC service concept plan. redisciple wrote: I would like to see 3 buses run on Washington in Downtown to better serve the Mill District after CC is up, in which case it would make sense to take these exits, but they didn't put that change (suggested in the Access Mpls plan) into the CC service concept plan. That would make too much sense. The space between the northbound and southbound decks of the Washington Avenue Bridge has been filled in, which somehow makes going across it on the bus seem way safer. Was traffic flowing on both sides of the bridge again? From the weekly CCLRT newsletter, it looks like the bridge should be in its new normal road configuration by tomorrow. The southeast connecting ramp from Cedar Ave to eastbound CR-122 should also be open. Apparently access from NB I-35W to Washington Avenue won't be restored for a while yet -- traffic signals haven't been installed. Seems a bit strange, since a lot of the intersections along University Avenue seemed to get signals before the pavement was even done.